John James Osborne (12 December 1929 – 24 December 1994) was an English playwright, screenwriter, actor, known for his excoriating prose and intense critical stance towards established social and political norms. The success of his 1956 play Look Back in Anger transformed English theatre. Osborne was one of the first writers to address Britain's purpose in the post-imperial age. He was the first to question the point of the monarchy on a prominent public stage. During his peak (1956–1966), he helped make contempt an acceptable and now even cliched onstage emotion, argued for the cleansing wisdom of bad behaviour and bad taste, and combined unsparing truthfulness with devastating wit. In 1935 the family moved to the Surrey suburb of Stoneleigh, in search of a better life, though Osborne would regard it as a cultural desert – a schoolfriend declared subsequently that "he thought [we] were a lot of dull, uninteresting people, and probably a lot of us were. He was right." He adored his father and hated his mother, who he later wrote taught him "The fatality of hatred … She is my disease, an invitation to my sick room," and described her as "hypocritical, self-absorbed, calculating and indifferent." Thomas Osborne died in 1941, leaving the young boy an insurance settlement which he used to finance a private education at Belmont College, a minor public school in Devon. He entered the school in 1943, but was expelled in the summer term of 1945, after whacking the headmaster, who had struck him for listening to a forbidden broadcast by Frank Sinatra. School Certificate was the only formal qualification he acquired, but he possessed a native intelligence. After school, Osborne went home to his mother in London and briefly tried trade journalism. A job tutoring a touring company of junior actors introduced him to the theatre. He soon became involved as a stage manager and acting, joining Anthony Creighton's provincial touring company. Osborne tried his hand at writing plays, co-writing his first, The Devil Inside Him, with his mentor Stella Linden, who then directed it at the Theatre Royal in Huddersfield in 1950. Around this time he also married Pamela Lane. His second play Personal Enemy was written with Anthony Creighton (with whom he later wrote Epitaph for George Dillon staged at the Royal Court in 1958). Personal Enemy was staged in regional theatres before he submitted Look Back in Anger. Written in seventeen days in a deck chair on Morecambe pier where Osborne was performing in a creaky rep show called Seagulls over Sorrento, Look Back in Anger was largely autobiographical, based on his time living, and arguing, with Pamela Lane in cramped accommodation in Derby while she cuckolded him with a local dentist. It was submitted to agents all over London and returned with great rapidity. In his autobiography, Osborne writes: "The speed with which it had been returned was not surprising, but its aggressive dispatch did give me a kind of relief. It was like being grasped at the upper arm by a testy policeman and told to move on". Finally it was sent to the newly formed English Stage Company at London's Royal Court Theatre. In 1993, a year before his death, Osborne wrote that the opening night was "an occasion I only partly remember, but certainly with more accuracy than those who subsequently claimed to have been present and, if they are to be believed, would have filled the theatre several times over". Reviews were mixed. Most of the critics who attended the first night felt it was a failure, and it looked as if the English Stage Company was going to go into liquidation. The Evening Standard, for example, called the play "a failure" and "a self-pitying snivel". But the following Sunday, Kenneth Tynan of The Observer – the most influential critic of the day – praised it to the skies: 'I could not love anyone who did not wish to see Look Back in Anger,' he wrote, "It is the best young play of its decade". Harold Hobson of The Sunday Times called Osborne "a writer of outstanding promise". During production, the married Osborne began a relationship with Mary Ure, and would divorce his wife, Pamela Lane, to marry Ure in 1957. This was in the summer of 1955 and Osborne spent much of the next two years before their divorce hoping they would reconcile. In 1956, after Look Back in Anger had opened, Osborne met her at the railway station in York, at which meeting she told Osborne of her recent abortion and enquired after his relationship with Mary Ure, of which she was aware. In April 1957, Osborne was granted a divorce from Lane, on the grounds of his adultery. Osborne and Gilliatt were married for five years (together for seven), and became the parents of his only natural daughter, Nolan. Osborne had an abusive relationship with his daughter: he cast her out of his house when she was seventeen; they never spoke again. Osborne and Gilliatt's marriage suffered through what Osborne perceived to be an unnecessary obsession on her part with her work, writing film reviews for The Observer. "I tried to point out that it seemed an inordinate amount of time and effort to expend on a thousand-word review to be read by a few thousand film addicts and forgotten almost at once." Osborne signed off the chapter on Bennett with perhaps some of his most damning prose committed to print. Dawson (1939–2004) was a former arts journalist and critic for The Observer. This final marriage of Osborne's, which lasted until his death, seems to have been Osborne's first happy union. Until her death in 2004, Dawson worked tirelessly to preserve and promote Osborne's legacy. Osborne died deeply in debt, his final word to Dawson was: Sorry. After her death in 2004, Dawson was buried next to Osborne. After a serious liver crisis in 1987, Osborne became diabetic, injecting insulin twice a day. He died in 1994 from complications from his diabetes at the age of 65 at his home in Clunton, near Craven Arms, Shropshire. 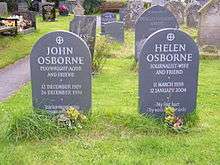 He is buried in St George's churchyard, Clun, Shropshire, alongside his last wife, Helen Dawson, who died in 2004. ↑ Schoolfriend Hilda Berrington, speaking on Osborne: Angry Man, Channel Four. ↑ Little & McLaughlin 2007, p. 326, cite a letter from Stephen Daldry "I have in our archives letters from members of the audience from the original production of Look Back in Anger demanding their money back. Had we honoured every one of those requests, this theatre would not have been able to survive"
1 2 "'It's me, isn't it?'". The Guardian. 6 March 2007. ↑ Colin, who took the name Osborne but was and is the spitting image of Robert Shaw, with whom Mary Ure was starring at the Royal Court when she became pregnant. ↑ Heilpern, John (29 April 2006). "A sense of failure". The Guardian. London. Retrieved 7 May 2010. ↑ Heilpern writes (Heilpern 2006, p. 443) that the second volume of Osborne's autobiography was ready to go to press at Faber & Faber. Bennett's suicide freed Osborne from the restraining order arising from their bitter divorce. He sat down and wrote a new chapter for the book, specifically to excoriate his ex-wife. ↑ "Helen Osborne". The Independent. London. 19 January 2004. Retrieved 7 May 2010. ↑ Morrison, Blake (20 May 2006). "Stage-boor Johnny". The Guardian. London. Retrieved 7 May 2010. ↑ Written before LBIA but not staged at the Royal Court Theatre until 2 years later. ↑ Uncredited, due to a script war with director Tony Richardson.